You are currently browsing the Stick Figure Sketchblog & Webcomic Creator @ Stewped.com weblog archives for August, 2006. The new comic is up. Adventures abound. Here is the 2nd panel in a huge story written by Danny B. I don’t know how i want to color it yet. Here is the winner! Evan Sheehan of Some Hippy Town, USA. I laughed so hard at the first line. And then I laughed even harder when Stew just ignores what the girl says and assumes she’s an orphan. That is my favorite part. And the fact that she even goes along with him without fighting? She deserves to die! Evan wins the coveted line-art with his terribly mean entry. Enjoy! I had loads of fun lettering the entries. All 4 of them. This was so hard to decide I almost didn’t. This was almost the perfect entry. Being mean to small children is always funny. As is the idea that the kid died being sad. The only problem I had with this entry was that it was too wordy. If I had drawn it bigger in the first place, the words would fit and this would win. You get a prize, but not the grand prize, Chris Miller. Name it and it is yours. Runner up #2 – Janis D.
This is the most surreal entry I received and that made it stand out above the #3 entry. I only edited some of the punctuation on this one. I liked this one because it helped to explain that box of human parts that can be seen in a couple of strips. However, it needed some work. I’ve tweaked the words a little and made changes that I think make the comic a little bit funnier. Below the comic is the original entry. You people tell me what one works better: the one in the comic or the entry. Jon: Hey Stew, why do we have a box of hands under the counter? Stew: Funny you should ask…. Little Girl: Hey Mistuh, do you gots any band aids? Stew: BAND AIDS!? MWA HAHAHAHAHA! Stew: Does this piss hole look like a hospital to you, you little hussy!? Stew: We sell clothes and clothing accesorys, take your wounds elsewhere! then put the hands in this empty box. Jon: Makes sense to me. 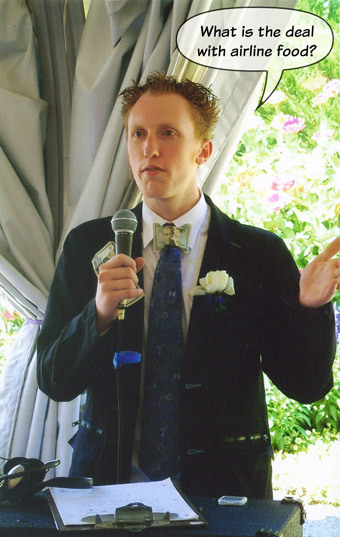 My wife just found this picture of me at our wedding. It has been almost a year and we still haven’t made our photo scrap book, ha! Anyway, I’m not sure what I was saying here, but some lucky photo-grapher captured me as if I were Jerry Seinfeld. I thought it was funny enough to share with you all. And congrats to nate for just getting married!